When I lived in Los Angeles and was eating out, I could never reach the level of culinary satisfaction that I had when I was in Utah. One of the places that I missed the most was Cedars of Lebanon. Cedars has a long history in Salt Lake. Opening in the fall of 1981, it was not only the first Middle Eastern restaurant in Salt Lake but one of the first to offer vegetarian cuisine. Old favorites like the gyro and falafel still hold a distinguished place on the menu, while new classics created by their Chef bring new a flavor to a time-tested menu. A new favorite of mine is the chicken tagine, a Moroccan orange curry dish that is seasoned gently with garlic, peppers, onions, carrots and yellow squash, all mixed with large, tender pieces of chicken. The dish comes served on a steaming bed of basmati rice. Cedars offers an impressive drink menu featuring imported beers and wines. 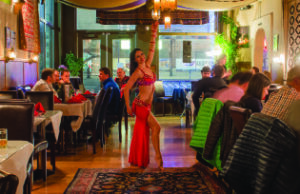 The newly remodeled restaurant also hosts a live belly dancer on Friday and Saturday nights.